Overcome with awe at the aura that surrounds the National Shrine of St Thomas Basilica at Santhome, you might tend to overlook a narrow lane that lies adjacent to the southern compound wall of the cathedral that leads you towards the seashore. A walk down this lane takes you to what seems to be a coastal hamlet that lies in the midst of what seems to be a tall,weathered wooden pole. On looking back,the tall spire of the cathedral is almost hidden by the trees in the vicinity – it is the wooden structure that occupies pride of place and rightly so. After all,the very foundation of the Christian faith in the city owes its existence to the wooden pole and the legend behind it. According to the legend, shortly after St Thomas arrived in India in 52 AD, a large wooden log was carried downstream by a river in Mylapore, to lodge itself by the river’s mouth and result in a flood. Try as hard they might,the king’s men failed to remove the log,which prompted the king to call on a certain hermit who lived in the area and was believed to perform miracles.” Along came St Thomas with a blessed girdle that was given to him by Mother Mary (the mother of Jesus Christ), “narrates Fr. S. Kanickairaj, the Rector and Parish Priest of the National Shrine of St Thomas Basilica, as he retraces the Legend, “He prayed for a while, and tied the girdle to the log.He heaved.With the first try,the log was removed and the river flowed into the ocean. St Thomas then took a portion of the log and planted it,pointing towards the heavens, stating that the sea would never cross the pole.” The legend,according to Fr. Kanickairaj goes on relate how the pleased king, as a sign of gratitude, offered Mylapore and its surrounding areas to the saint, who then constructed a small chapel near the sea, which today (after a series of renovations) is the majestic Neo-Gothic-styled National Shrine of St Thomas Basilica – a development of what was perhaps the very first church in the city. “Many believe that the reason that Santhome escaped the Tsunami of 2004 is simply the existence of the pole which continues to stand upright today,” he says. “The St Thomas Pole; in gratitude to God for saving Santhome from Tsunami 2004,”its inscription declares. One of only three churches to be constructed over the tomb of an apostle (the other two being St. Peter’s Basilica in Rome and the Cathedral of Santiago de Compostela in Spain), the National Shrine of St Thomas Basilica has all the makings of a site that abounds in religious significance. “The body of St Thomas was interred here until the 12th Century before the Papacy decided to ship his remains back home,” explains Fr. Kanickairaj. The Cathedral Museum houses a tiny relic of the apostle with the spear that brought his end. In the same museum, one can find inscriptions in Portuguese about St Thomas’ journeys in the city and his early ministry. Murals of the miracle by the river and rock carvings of King Gondophares (of the Indo-Parthian kingdom who St Thomas preached to in North India) are also present. Just below the museum is the crypt where the body of St Thomas was interred. “The site has miraculous powers even today, centuries after the saint died,” claims Fr. Kanickairaj. When the Portuguese wrested control in erstwhile Madras, they reconstructed St Thomas’ small shrine into the original cathedral (whose design is displayed in the museum), before the English constructed the present Neo-Gothic basilica in 1896. Despite the renovations that it has seen, there’s no denying that the National Shrine of St. Thomas Basilica was once the first church to be established in the city, when the apostle constructed a small shrine in the landed that the king offered to him. “A few more churches were built-in the areas around the shrine,” explains Fr. 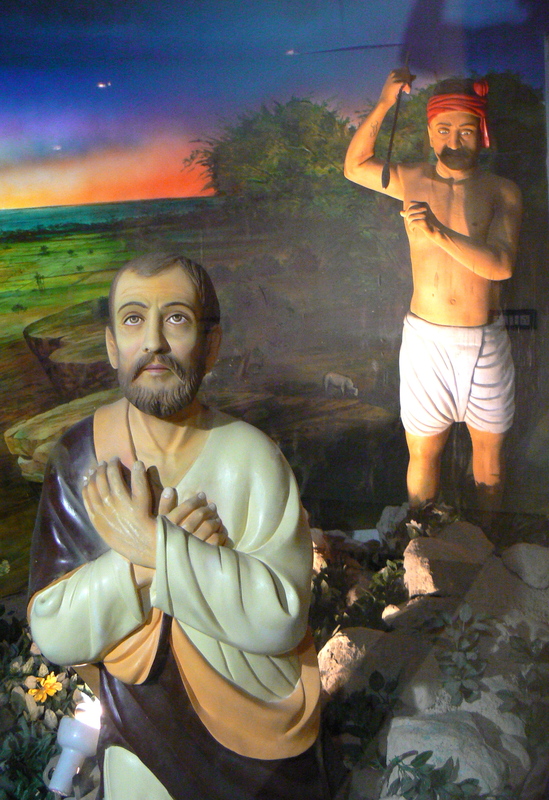 Kanickairaj, “Together, these churches were the first that the city saw.” The miracle-working power of St Thomas – a man who walked with Jesus Christ has allured visitors from all over the world. Some of the more notable visits include Pope John Paul II who paid a visit to India in 1986 and prayed at the tomb of St. Thomas, and King Albert and Queen Paolo of Belgium who visited the city in 2008. 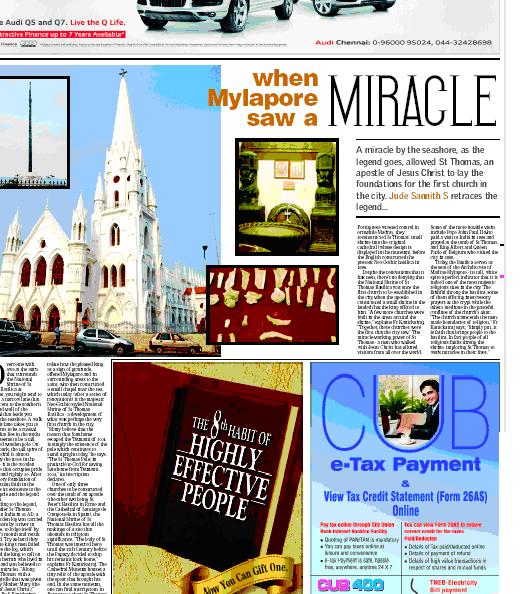 This entry was posted in madras-mylapore archdiocese, mylapore, religion, roman catholic church, santhome cathedral, st. thomas, thomas the apostle and tagged apostle thomas, madras-mylapore archdiocese, mylapore, santhome cathedral, st. thomas, times of india. Bookmark the permalink. Why do self-respecting Tamilians run after the white man’s god?